Click on the arrow buttons to hear the piano tunes. 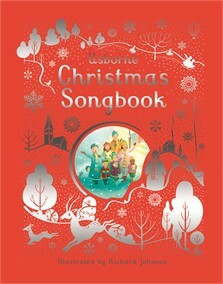 A fabulous clothbound hardback book with simple arrangements of traditional Christmas carols and music for voice and piano. There are lyrics for all the carols, and chords for playing on a guitar, and the melody line can also be played on a recorder or violin. With beautiful illustrations, this lovely book will be enjoyed for many Christmasses.